Pastors all across America are looking at their sermon schedules, realizing that Sunday is All Hallows Eve, and having one of two responses. For some, it'll be time for the annual sermon reminding parents to keep their kids safe from the pernicious influence of Satanism. And neighbors. And fun. For the pastors who aren't totally and utterly uncool, though, the question is this: how can I work zombies into my sermon? 'Cause you just gotta have zombies. Vampires? Well, they're just meh. Particularly those sorry sparkly ones. Zombies are hot. They're everywhere in our culture, a seemingly endless font of hipster delight. Over the last few years, it's not just that I've watched and enjoyed Shaun of the Dead and Zombieland. I've heard bluegrass songs about zombies. I've read bits and pieces of the bizarrely entertaining Jayne Eyre mashup "Pride and Prejudice and Zombies." I've watched as one of the best games of 2010, the brilliant western-themed "Red Dead Redemption" offered up it's first expansion pack...in which you're not just a gunslinger in a western town. You're a gunslinger in a western town...with zombies. Like, awesome, dude. There are zombie parties, and zombie walks, in which hundreds of folk get together to shamble down the street. 1) It eats your brain. A zombie church isn't really interested in you as a person. Your identity as a unique child of god means nothing. The ways you might bring your particular gifts and hopes into it mean nothing. The thoughts in your cortex mean nothing to it. You're just pew-filling meat and easily digestible neural tissue. You are just this tasty thing that will keep it going as it shambles on to its next victim. Depending on the damage that does, it will leave you either completely torn to pieces or, rarely, shambling alongside it in the search for more braaaains. 2) It can't grow. A zombie church doesn't ever change, outside of having pieces fall off now and again. Living and dynamic congregations welcome change, welcome the new, growing and expanding as they acknowledge new gifts in the community. But zombie churches just keep doing the same thing, long past the point that that thing had any life in it at all. They repeat the same events, not as affirming ritual, but as mindless process. They shamble through their life together, throwing one foot in front of another while animated only by a glazed hungry emptiness. 3) It isn't really alive. 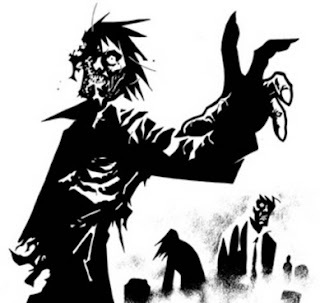 Zombie churches live for reasons that have nothing to do with the new life that comes with the indwelling of Christ's spirit. They can be driven by hatred or group think or the hunger for material prosperity. Those ones tend to be faster and more dangerous. Then there are the slower, more classic Night of the Living Dead Zombie churches. They tend to be sustained by endowments or pools of resources that let them keep doing the same things they've always done, even as they slowly rot away to nothing. They're easier to avoid, as they tend to just gimp around in circles moaning to themselves. So as you're out there, wandering through the desolate wasteland of American Christianity looking for a community of faith that might sustain you, just keep these things in mind. And remember, cardio, cardio, cardio.